Before coming to the Marquesas, I had read or heard very little about the island of Tahuata; but if I ever come back to the Marquesas, I will plan to spend a lot more time there. 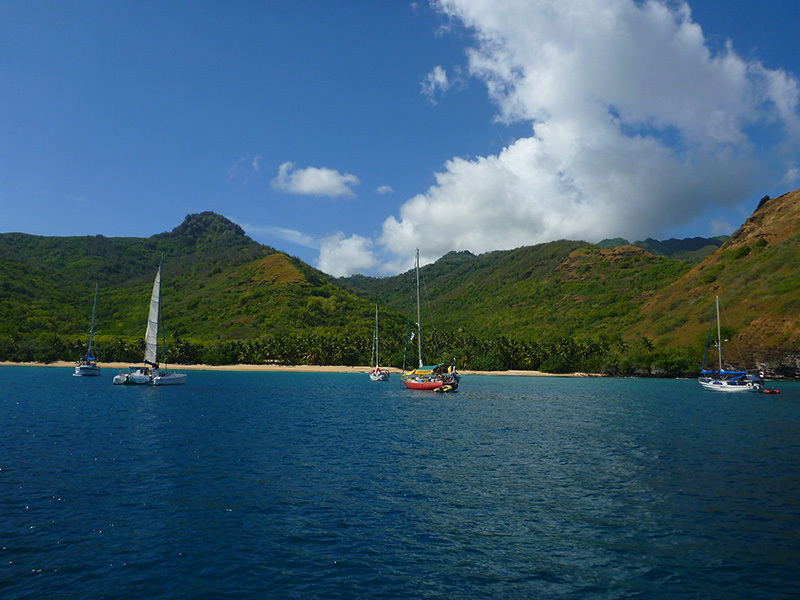 I had heard a lot about the popular anchorage at Baie Hanamoenoa: one of a few white sand beaches with good visibility in the Marquesas. 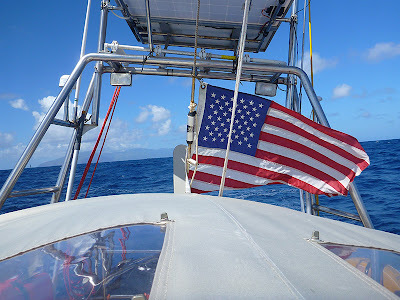 Hanamoenoa is popular with cruisers for the snorkeling, but also probably because the good visibility (you can see the sharks ahead of time) makes it safer to clean the boat’s hull and prop after a 3,000-mile passage. 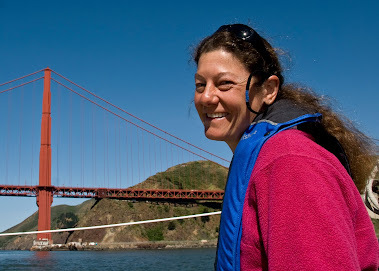 I was particularly interested in visiting this bay to see the giant manta rays that feed in it. 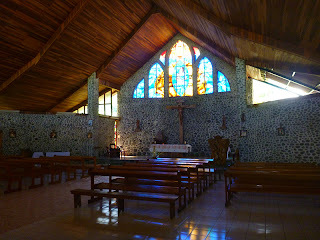 I also knew there was a village on the island where basic supplies were available and where some people attended the church service on Sundays. 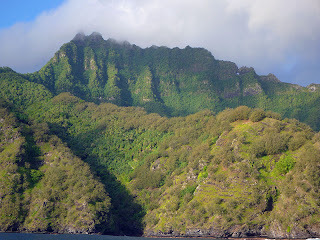 What I didn’t know was that Tahuata actually has more good anchorages than most of the other islands in the Marquesas. It would be well worth taking the time to explore them all. 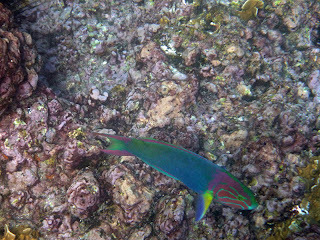 I thought that Patrick and I had arrived late in the cruising season due to our stop in the Galápagos. It turns out we are only late in terms of the American fleet, most of whom are in the Tuamotus or Society Islands by now. The French and Kiwi (New Zealand) fleets are still going strong here in the Marquesas, and Hanamoenoa was extremely crowded. 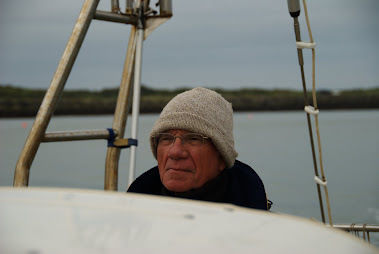 In contrast to our friends Karen and Jim on Sockdolager, who shared the anchorage with only one other boat when they were here in May, we shared the anchorage with 10-14 other boats! 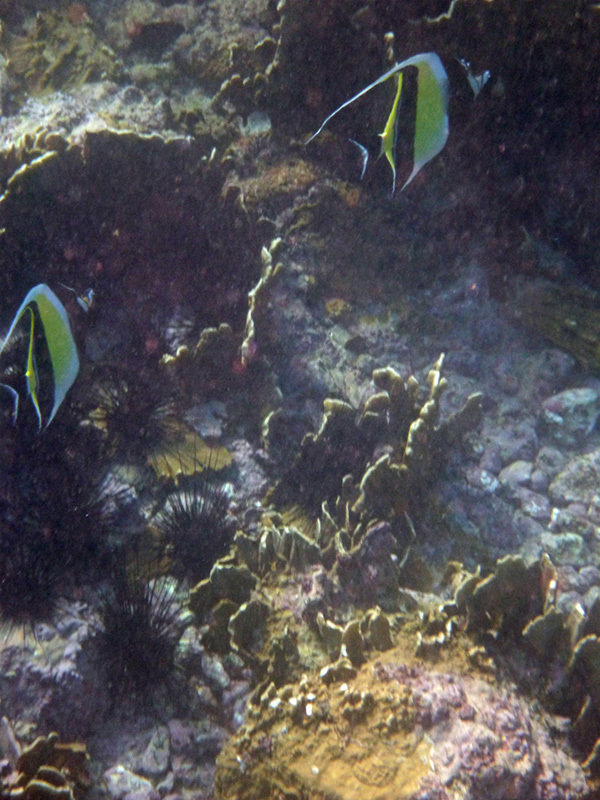 However, I learned that on either side of Hanamoenoa are white sand coves where it is possible to anchor. If we had stopped the first night, we could have anchored in one of these coves and had it all to ourselves---at least for a day---and taken a dinghy over to visit Hanamoenoa. 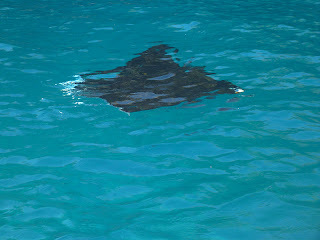 We did see about a half dozen of the giant manta rays during our stay at the anchorage. Three of them were foraging right next to our boat (we were anchored in deeper water due to the crowd), and we saw the others near the point during a dinghy trip over to the village. 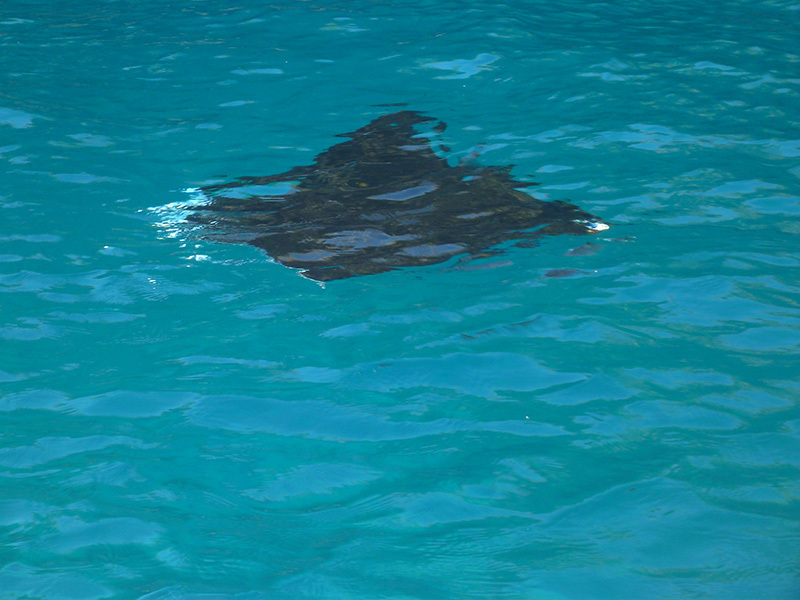 I only saw one manta ray while snorkeling and it was a younger, smaller one. 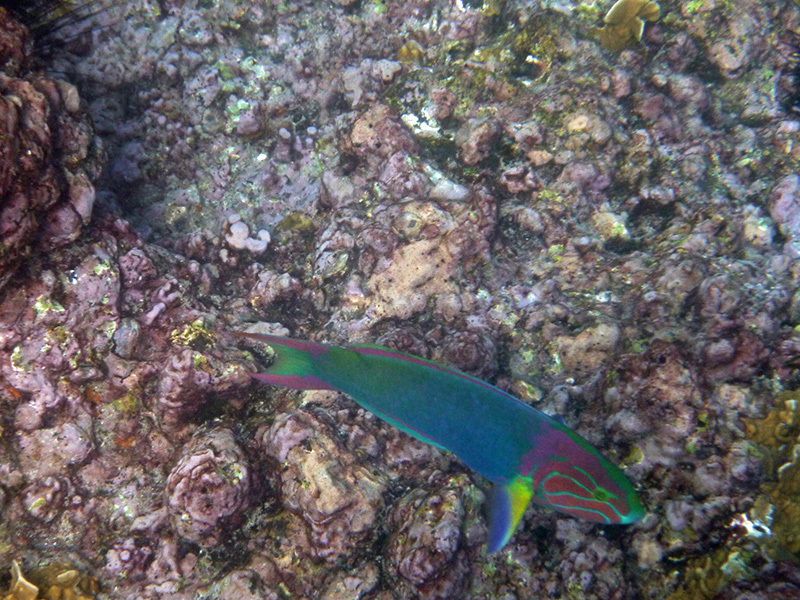 I also saw my first reef sharks while snorkeling in the bay. 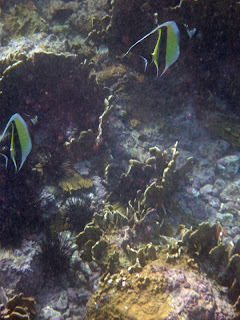 The visibility was not as good as touted due to waves breaking on the reef and saltation from the sandy bottom; however, we saw many more fish species snorkeling here than we did in Mexico. We visited the village of Vaitahu, a couple of coves over, by dinghy. 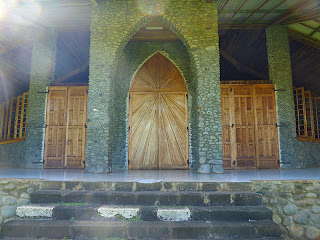 The stone and wood church there was truly stunning. 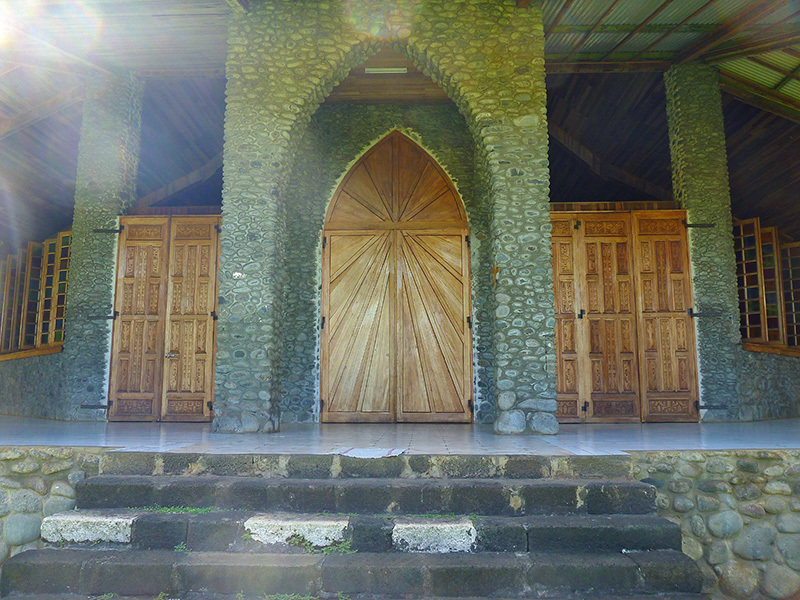 Look at the intricately carved doors. Inside, the stained glass detail depicts a Polynesian (brown-skinned) Mary and baby Jesus. but a small museum next to it was open. After paying 200 francs each (about $2), a local woman unlocked the door for us and we were able to take our time going through it. She had some limited English which, she told us, she had acquired during a two month visit to Australia, and she told us a bit about the museum’s history. Dr. Barry Rolett of the University of Hawaii headed an archaeological dig in Vaitahu. 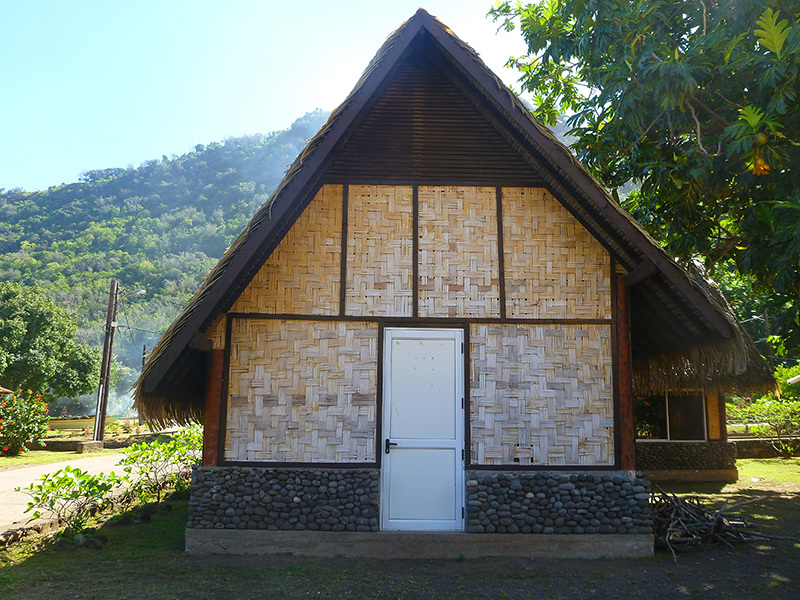 He and his students enlisted the help of local people and artisans, and some of the museum exhibits center around their work. 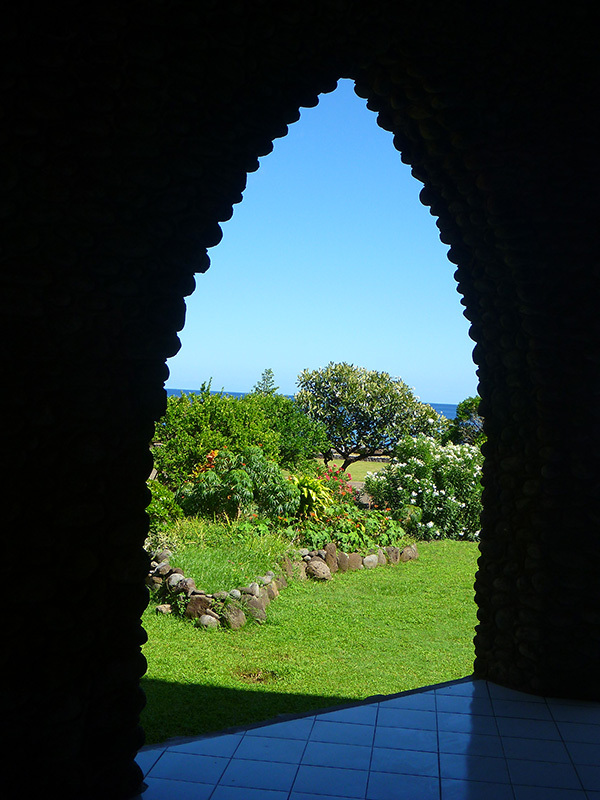 The team discovered the ancient village site of Vaitahu. As we learned in the museum (and have also observed during our wanderings), the old village sites were located along rivers at the heads of valleys, away from the beach; while today’s villages are located near the valleys’ bays. From what I could make of the exhibit, the ancient village was divided into four sections. Two of those sections, Pou-pou and "M" (I did not take notes in the museum, but the name of this section started with "M") were of special interest to me. 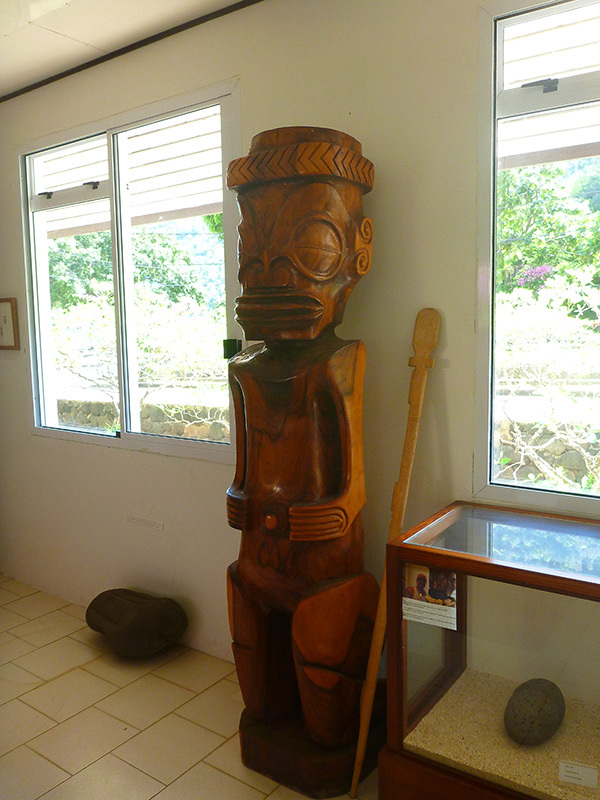 At Pou-pou, four large “face” tikis were discovered. Each tiki had a distinct facial design, indicating that it came from a different ancestor who was later deified. "M" was a sacred site used for human sacrifice. The drawing and photographs of the site in the museum show that it contained those elements which we are learning are common to these sites: Sacred sites were often located near a banyan tree; there was a large pit in which humans were imprisoned before cannibalistic sacrifice or into which human remains were thrown; there was a raised platform or “altar” to which only high priests had access, except on feasting days. These archaeological sites looked like fascinating places to visit, and when I inquired about whether it was possible to visit them, I was told that it was a long way (two hours by foot), and that there was no access (no trail or road). The archaeological team had cut down trees to access the site but the jungle has grown back over the trail. 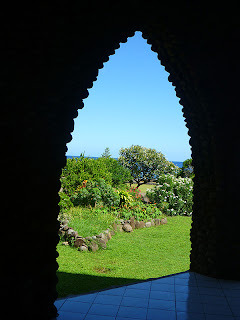 Still, I’m sure that some of the team still live on the island and remember the way to the ancient village site. If one was willing to invest the time and effort to spend a few days at Vaitahu, make the contacts, and bushwhack through the forest with a local guide, I’m certain the effort would be very rewarding. 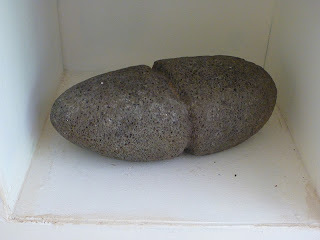 Just in case you thought I was kidding about the Bay of Virgins originally being named "The Bay of Penises," take a look at the artifacts below. The Marquesans of yore were definitely big on phallic symbols. 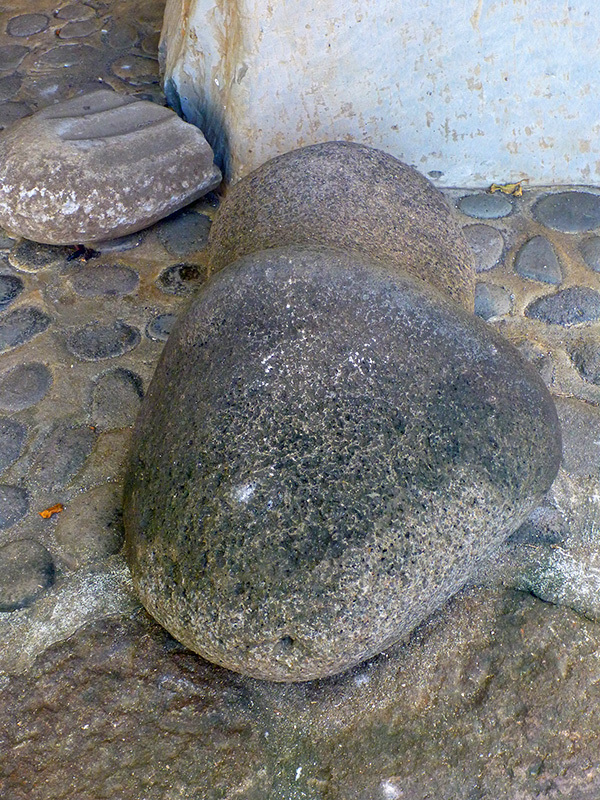 The first artifact was on display outside the museum, and the collection of pounders---used for grinding everything from leaves to poi---was found inside the museum. 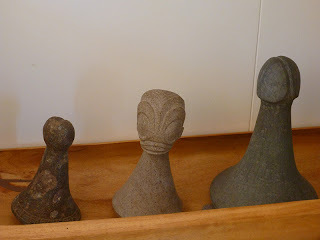 Another thing we learned at the museum was that each region of the South Pacific has its own specific tiki design. The Marquesans’ original name for their land was “Fenua Enata” (also seen as Te Henua Enana) or The Land of Men. 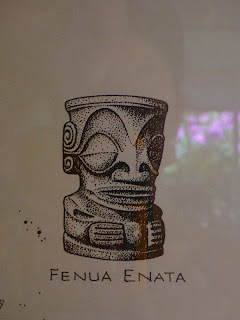 The picture below shows the tiki for Fenua Enata. And here is a wood carving of a tiki exhibiting the traditional Marquesan features. 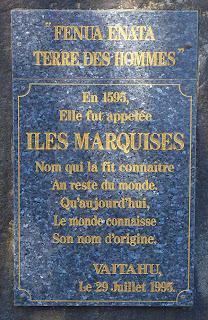 A plaque outside the museum contains a brief poem explaining the name change to the Isles Marqueses. I don’t know enough French to translate it, but I got the gist of it. 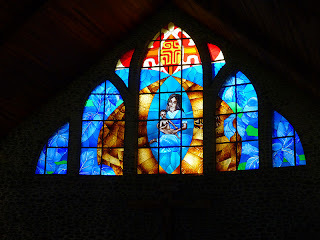 Can someone out there who knows French comment to the blog with the exact translation? Merci. 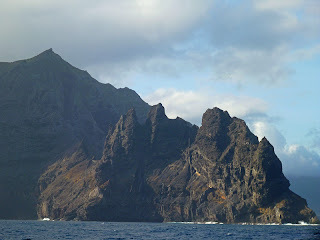 It's not a poem, just a declaration: beneath the the original name, it states: "In 1595, it was named Marquesas Islands, by which it was [made] known to the rest of the the world"; then, the reason for the plaque is given: "That today the world may know its original name." Thanks for that translation. 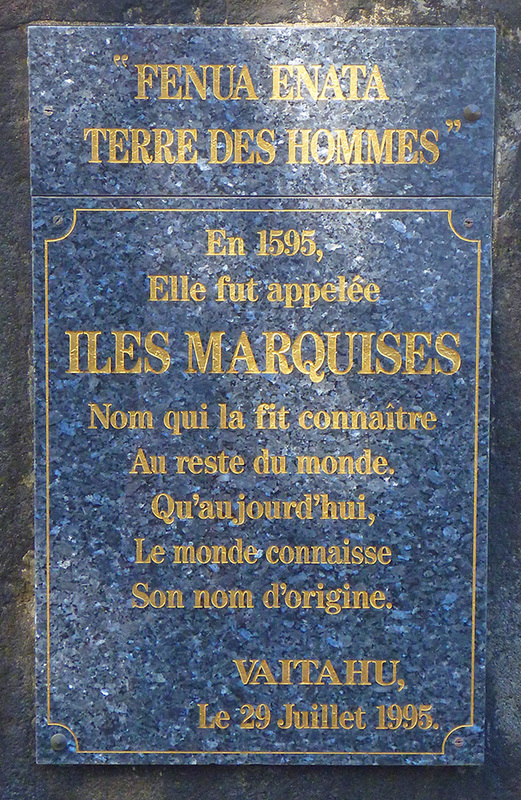 There seemed to be some music in the French which led me to believe the inscription in the plaque was in verse.